I have noticed a curious bug in the way MathJax is setup on MSE. 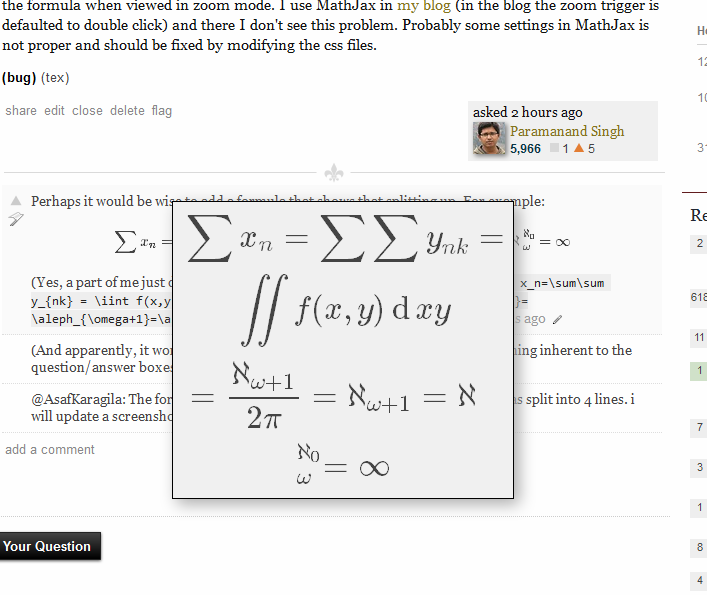 MathJax has feature to zoom its formulas via "Math Settings -> Zoom Trigger" menu option. I normally use this menu option and set double-click as the Zoom trigger and zoom setting to 200% so that double clicking zooms the content to twice the size (note that double-click opens up a new window where it shows the zoomed content) . It is helpful in viewing formulas having lot of small subscripts or superscripts. However this zoom splits a single line formula into multiple lines and this makes it difficult to grasp the formula when viewed in zoom mode. I use MathJax in my blog (in the blog the zoom trigger is defaulted to double click) and there I don't see this problem. Probably some settings in MathJax is not proper and should be fixed by modifying the css files. Further Update: I checked that this issue is specific to MSE only. The MO site does not have this problem. You can see the equation $(1)$ in question on MSE and the same question on MO. This I find very difficult to accept. The SE sites have automatic line breaking enabled, whereas your blog doesn't. That setting applies to the zoom box as well as the original expression, and since the zoom box is smaller in width and the font is larger, you will likely get more line breaking in the zoomed version. The reason that this only happens sometimes is that I think there is a bug with the zoom code that doesn't reset the wrapping width properly after a zoom, and so sometimes you are getting wrapping and sometimes not. There is an open Mathjax issue tracker for this issue. It should set the line breaking width to the scaled size of the original equation's line breaking width, so that the line breaking will be the same in the zoom and the original. When adding a comment, the issue is resolved throughout the page, until the next reload when it breaks down again.